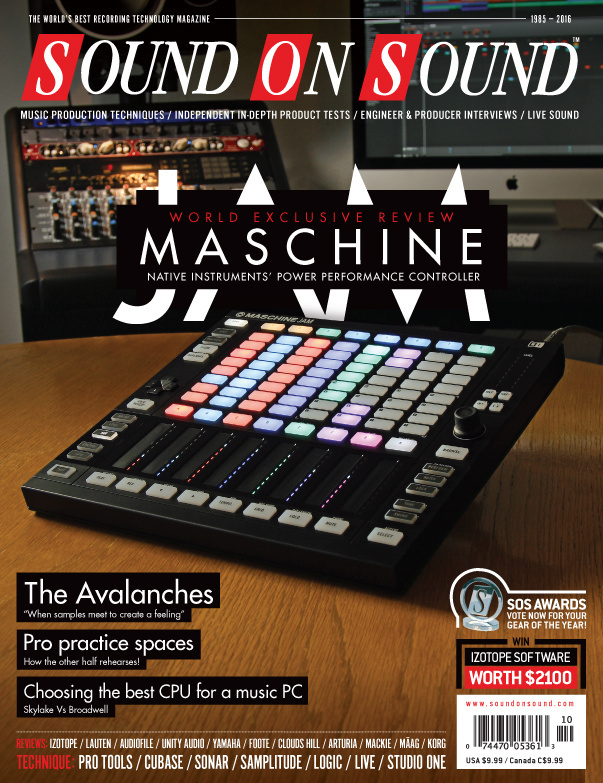 Reviews: Native Instruments Maschine Jam (Cover), Clouds Hill FX Echo, Make Noise 0-Coast, Unity Audio Super Rock, Mackie ProDX8, Twisted Electrons Acid8, Lauten Audio LA-320. Technique: Session Notes, Mix Rescue. Features: Robbie Chater & Tony Espie: Recording The Avalanches, The Rise Of The Large-scale Rehearsal Studio, Inside Track: John Feldmann & Zakk Cervini. Arturia have updated their V Collection, and one of the stand-out instruments is a recreation of Farfisa’s classic combo organs. Cinematic Samples take a refreshingly simple approach to the Hollywood orchestral sound. Can a technology borrowed from digital computers bring anything new to the world of analogue delay? This latest Drumdrops library of virtual drum instruments is the first to feature a newly-designed interface, with sounds of a 1966 Ludwig Hollywood kit, recorded by producer Phill Brown. EarMaster is a well-established name in the realm of ear training, having been around for the past 20 years, and the company have now launched a version of their eponymous software for the iPad. Boasting a novel construction method using traces printed on stacked circuit boards in place of traditionally wound coils, Fluence offers active circuitry, hum cancellation, a choice of two distinct voices and — most surprising of all — convincingly traditional sounds. We explore their newest addition. Mastering engineers looking for a compressor with a distinctly vintage flavour would do well to check out Roger Foote’s latest creation. Microphones that include A-D converters, allowing them to be plugged directly into computers or iOS devices, are becoming increasingly popular. IK's offering is built around a large-diaphragm capacitor mic with built-in 24-bit converters that support sample rates up to 48kHz. Is VocalSynth the natural choice for unnatural vocal sounds? How do you follow the best-selling synthesizer of all time? Lauten’s latest creation is a classy affair with a pleasingly neutral tonality, which should make it suitable for a wide range of sources. The EQ4M features the same Air Band that put Mäag on the EQ map — plus a whole lot more! Mackie’s new ProDX range makes phone- and tablet-controlled mixing more accessible than ever. Make Noise blur the boundaries between the East and West Coast schools of synthesis with this unique semi-modular. The Origin Effects SlideRig is a unique compressor pedal designed primarily for electric slide guitarists. The classic sound of the ADR Compex is back again — this time in API Lunchbox format! It will come as no surprise that Morphestra 2 is an evolution of a previous product. In this case, it is actually two products: Morphestra and Morphestra Generations. Swiss acoustic-amplification experts Schertler have entered the compact PA market, with impressive results. A Noah Bell is a type of Indian bell, traditionally sold by monasteries as a way of generating income. It’s usually necessary to assemble differing-sized bells into a set so that together they form a musical scale, and that’s what Soundiron have done to create this virtual instrument. The Studio Electronics Tonestar 2600 is a complete analogue synthesizer voice in just 32hp. It consists of a single VCO, a sub oscillator and noise generator processed by a four-pole low-pass filter based on that of the legendary ARP 2600. These new TAC modules bring the classic Amek console sound to your Lunchbox rack. Twisted Electrons offer a new take on the classic acid machine. We fire up the latest model in Unity Audio’s geologically themed monitor range to find out just how much it rocks! We delve into the depths of Live’s effects routing. After a rocky start, Avid’s Application Manager is now bringing useful features to Pro Tools users. Give Sonar a makeover with Cakewalk’s new Theme Editor. Blink 182’s chart-topping California brought Zakk Cervini his first mix credit on a hit album — but he had to work hard to get it. We offer six Logic Pro X tips and tricks that you might not know about. How can you enhance a live blues recording when all you have to work with is an MP3 of the mono ‘off-the-desk’ mix? How should a band prepare for their first session in a pro studio, and what can the producer do to help? We went to Kore Studios to find out. Studio One doesn’t officially support surround mixing — but that doesn’t mean it’s impossible! Steinberg’s dedicated app can turn your iPad into a fine control surface for Cubase. The Avalanches’ debut album Since I Left You took the art of sampling to new heights — but it has taken them 16 years to finish the follow-up! A reputation for competence is vital — and to get it, you need to take every opportunity going. Studios often fall prey to the real-estate business — but for some people, they present a niche opportunity. Learning music production the Abbey Road way isn’t cheap — but if it equips you to work in today’s music business, could it be money well spent? Media content for the October 2016 issue.